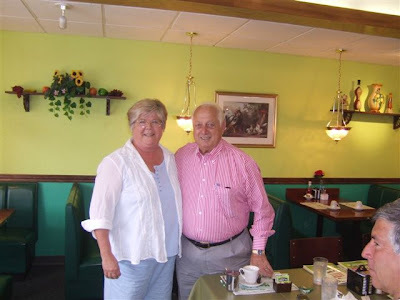 Roy Polman, pastor of the Cherry Valley Grace Brethren Church in Beaumont, California, and his wife, Judy (at left in photo) were eating breakfast last Friday, July 27 at Maria’s House of Pancakes just off Rt. 30 and County Road 250E at the entrance to Winona Lake, Indiana. They thought the guy in the pink shirt looked familiar. Sure enough, it was Tommy Lasorda (at right in photo), Hall of Fame former manager of the LA Dodgers, enroute with a group to the Hall of Fame in Cooperstown, New York. The Polmans had a nice chat with Lasorda, who in his 20 years of managing the Dodgers won two World Series championships, four National League pennants, and eight division titles. Lasorda was inducted into the Baseball Hall of Fame in 1997.